Black & white kalidaar Lehenga choli/ Anarkali with contrast border in pink for evening wear with intricate thread embroidery with touches of gold. 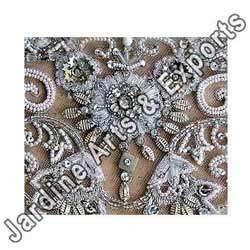 Attractive (white color) beaded embroidery work have been used to make this beautiful design on lehenga choli thus making it an item near to one's heart. The beads have been entwined with silk thread to give life to some exotic floral patterns that look extremely beautiful and ethereal. Looking for Lehengas Embroidery ?